Spring Salad with Garlic Herb Croutons and Spicy Garlic Dressing | Om nom nom! I was looking for a light salad to go with our Easter dinner, and ended up just deciding to toss some spring greens with these croutons and dressing. I usually just toss croutons with some herbs and olive oil, but I liked infusing the oil for this and will do it again. As a side note, next time I will skip the parm – the croutons didn’t need it, but you should give it a try to see if you like it. I think next time I would just dress the salad with a bit of parm. The dressing itself was very tangy…I do not generally care for salad dressing, but I really liked this vinaigrette! In a small saucepan combine the garlic, the oregano, the basil, the thyme, 1/2 teaspoon of the salt, the pepper, and the oil and simmer the mixture for 5 minutes, and discard the garlic. In a bowl toss the bread cubes with the oil mixture, spread them in a jelly-roll pan, and bake them in ht e middle of a preheated 350°F oven for 8 minutes. Sprinkle the croutons with the Parmesan and bake them for 7 minutes more, or until they are golden. Sprinkle the croutons with the additional salt and let them cool. The croutons keep in an airtight container for 1 week. 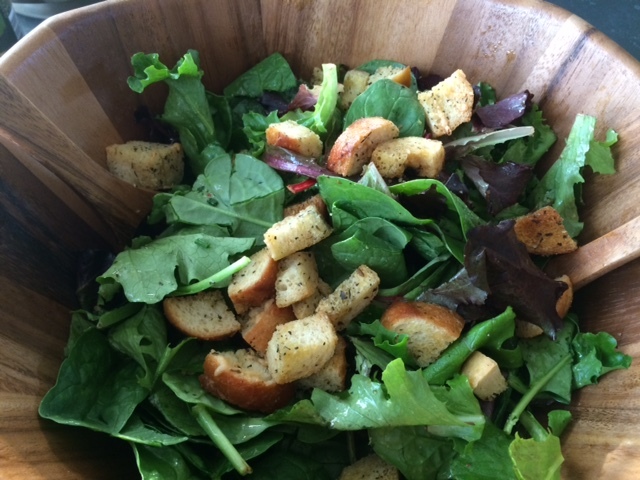 Serve the croutons as a topping for tossed green salad. Pour all ingredients in the blender and pulse until well combined. Store in a mason jar and shake before serving.